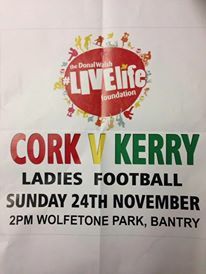 All Ireland Ladies Champions Cork v Munster Ladies Champions Kerry Wolfe Tone Park Bantry on Sunday November 24th at 2pm!! All proceeds go to the Donal Walsh LIVELIFE Foundation! A great family day out guaranteed!